The watchdog said that Kela's selection criteria prioritises low prices over suppliers' social responsibility. 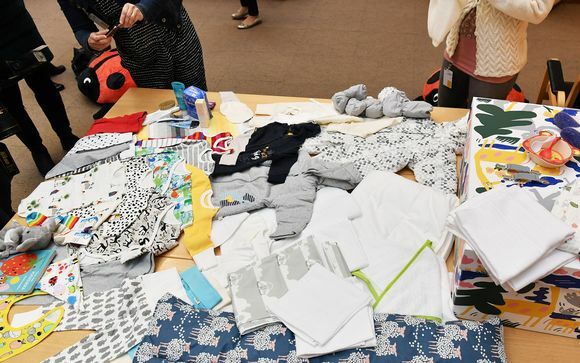 More than ten products reviewed in Finland’s world-renowned baby box are made in circumstances that involve serious labour rights shortcomings, according to the corporate responsibility watchdog Finnwatch. The NGO said that the problems are rooted in the selection criteria of Kela, the national benefits agency that provides the baby boxes to expectant mothers. According to Finnwatch, the bidding criteria prioritise low prices over corporate responsibility. On Tuesday, Finnwatch published a report with detailed information on 40 products included in the 2018 new baby starter kit. It’s the first report to provide comprehensive information on the origin of baby box products and the kinds of labour practices behind them. Kela distributes roughly 40,000 newborn kits every year. "The majority of products purchased for Kela’s baby box are made in sweatshop countries, where there is a higher risk of labour rights violations in product production," said Finnwatch executive director Sonja Vartiala. Most of the products come from China. Of a total of 63 products in the 2018 baby box, 13 are manufactured in China. After China, the largest supplier countries are Pakistan, India and Bangladesh. The report was based on a review of companies as well as an analysis of external audits. Finnwatch also obtained from Kela a list of 18 products sourced from suppliers for the maternity starter kit. The NGO sent out questionnaires about the products, the origin of their raw materials and corporate responsibility oversight to all of the firms. Just two companies did not return responses. "The majority of companies that supplied products for the baby box however, were very open and shared a great deal of information about their subcontractors," Vartiala noted. Serious shortcomings such as illegal overtime, inadequate wages or workplace safety deficiencies were identified behind 12 of the products. The risk of major human rights problems was even greater when it came to raw materials whose origin respondent countries knew nothing about. "For example cotton production has been linked to human rights risks such as abuse of child labour, forced labour and harvesters’ death by poisoning. Still just one of the textile products in the baby box was manufactured using cotton with a sustainability certificate," Vartiala pointed out. Finnwatch reprimanded Kela for overlooking responsibility and sustainability in its competitive bidding criteria. Kela for its part said that the report is important and assisted with drawing it up. In a separate statement issued Tuesday, Kela said that it plans to improve social responsibility in sourcing products for the baby kit. The agency said that it has already added sustainability criteria to bidding criteria for the 2020 package. Kela’s corporate social responsibility coordinator Petra Elomaa said she hopes that companies will offer responsibly-made products for the baby starter kit. "The maternity kit is an important social innovation and a source of pride for us in Finland. Companies supplying products for the package must, among other things, that the workers who manufacture their products comply with the International Labour Organisation’s general agreement on minimum age requirements," she added. Bidding for the supplying baby box products is subject to public procurement legislation. The law stipulates that bidders must be treated equally and without prejudice. This prevents Kela from favouring products on the basis of their supplier or the country in which they were manufactured, the agency noted in its statement.